We rely heavily on the COMPUTER to run our business; just like all of our lives are so rich due to the computers that run the world. Estimates are computer driven, and the work and scheduling is monitored digitally. The day of the Neanderthal Contractor is dead--we will never write a number on a piece of paper and call it an estimate. You get a computer driven estimate, contract, correspondence, and explanations; so you know they are accurate, organized, and prompt. This is why we can give specific start and completion dates with each job. We also use only the LATEST EQUIPMENT, KNOWLEDGE AND MATERIALS for each job; we know our clients want the best, and the quickest. 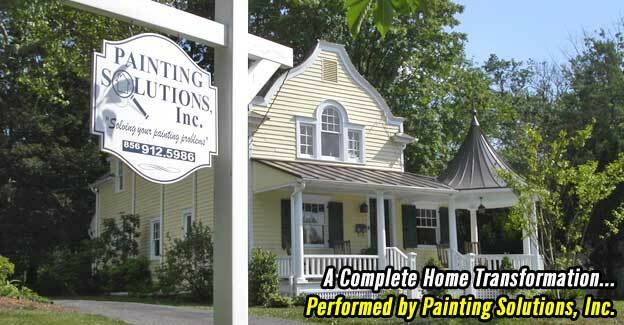 As an example, on exterior painting, we don't try to be a "Jack of all trades." We use only a professional power washer who is a member of the National Power Washers Association of North America--up on the latest chemicals and equipment. Not only does he bring his own water to the site, he almost boils it too. What is better for pollutants and grime on a house: your 47 degree tap water most painters use, or 180 degree hot water, with the appropriate cleaner that will not kill flora and fauna? Technical support is paramount to any painting contractor because of all the sloppy old workmanship we can run into. So many variables go into getting good results from a paint job. If one is not done correctly, or corners cut (which happens too often, as painters like to cut corners to enhance profits, at the expence of the client's poor paint job evident a few years later), in too short a time we often are called to the site to correct the problem. We have local and national contacts that can analyze the situation, and come to agreement on the course of action to correct the situation. Unfortunately, often it is more expensive than if the client had hired a professional painter in the first place. We have often used special technicians, and the PDCA technical team in these efforts.